Letting Only – our tenant finding service. 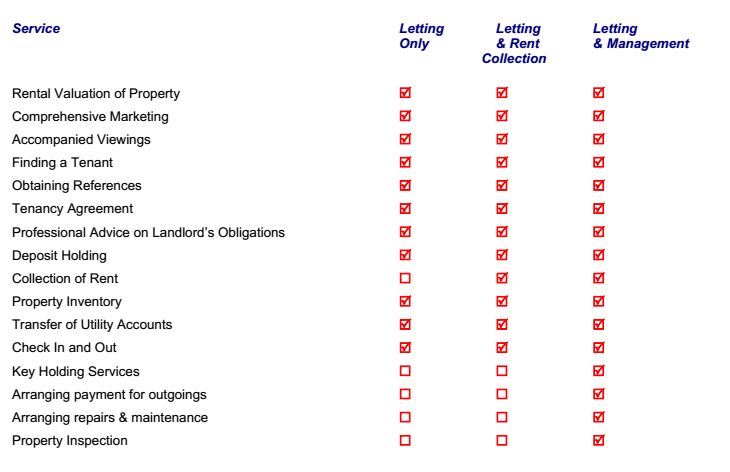 Letting & Rent Collection - including the collection of rent for Landlords who would rather not or are unable to collect regular payments. The information below gives an overview of the services that we can offer. Additional services are available and can be arranged as required. We will carry out a valuation at your convenience and advise you of an achievable rent. We will also offer you guidance and advice on any improvements that might be carried out before marketing commences. We will accompany potential tenants to view your property when necessary. We will interview all potential tenants to ensure their suitability. All our tenants are subject to a stringent referencing procedure to confirm the tenant’s suitability and financial viability. We will take a £250 holding deposit and with your approval, the property will be withdrawn from the market for a period of up to 10 days giving time to complete all necessary paperwork. Should you withdraw from the proposed rental, 100% of the holding deposit will be returned to the prospective tenant. If the tenant is found to be unsuitable or they withdraw, 50% of the holding deposit is returned to the prospective tenant and 50% is retained by Prime Property to cover administration. If Guarantors are required we will organise this with the prospective tenant. We will draw up an Assured Shorthold Tenancy Agreement for both parties to sign. If the rental income is £85000 per annum or more a Common Law Tenancy will be required. From October 1st (EPC) for all rented property with new tenants and it is best practice not to market your property until this has been ordered. The EPC gives prospective tenants information on the energy efficiency and carbon emissions of a building. We can arrange this for you (see additional services) or you can organise this yourself. It is a legal requirement that the gas supply and any appliance provide by the Landlord are checked annually by a GAS SAFE registered gas installer and a Landlords Gas Safety Certificate is issued. Your tenant cannot move in until this has been provided. We can arrange this for you (see additional services) or you can organise this yourself. Although not required by law at the moment, we recommend that you ensure the electrical supply and all electrical appliances are safe and tested by a qualified electrician. It is advisable to install at least one battery operated smoke alarm on each floor of your property if a mains operated alarm cannot be fitted. We will take a deposit of an amount equivalent to one month’s rent, from the tenant prior to them moving into the property. From April 2007 there are strict statutory regulations governing tenancy deposits and it is now unlawful for any person to take and hold a Tenancy Deposit unless registered to do so. All deposits paid to us are protected by one of the government’s Tenancy Deposit schemes and in the unlikely event of a dispute at the end of the tenancy we can refer the matter to The Dispute Service who will adjudicate. We will collect the first month’s rent in advance together with the deposit before the tenant has access to the property and present you with a reconciliation statement. We will also arrange, with the tenant, for a monthly Standing Order to be set up for the date specified in the Tenancy Agreement. If you are using our Letting & Rent Collection or Letting & Management service, we will pursue late payments and report any arrears. We will also issue a monthly rental statement and can transfer funds directly into your account. We can read gas and electricity meters at the start and end of each tenancy and can advise the utility companies and the local council when a tenant moves in or out. We can meet your tenant at the property (if required) and hand over the keys. We can also agree the inventory report with your tenant and read the meters at this time. This is obligatory for our Letting & Management Service. A fee of one months rent as stated in the tenancy agreement, payable at the commencement of the tenancy. In addition to our tenant finding fee an additional charge of 10% of the gross monthly rental income paid monthly for the entire length of the tenancy, extension or continuations as stated in the tenancy agreement. There are a number of regulations that govern the letting of residential property to which all landlords must comply. The penalties for failing to do so are severe and could result in heavy fines and/or imprisonment. It is our duty, as your letting agent, to advise you of your obligations, the implications of the regulations and to assist you in ensuring you are fully compliant. It is an offence to let out property containing furniture and furnishings that do not comply with these regulations. If a property is found not to comply the landlord could face up to six months imprisonment and/or a fine of up to £5000. The regulations state that the offence is committed when the furniture is supplied ‘in the course of business’. Investment or professional landlords are therefore clearly covered by the legislation. A landlord letting his own home on a ‘one-off short-term’ basis and not ‘in the course of business’ has a moral responsibility to ensure the furniture complies, but may be exempt from the regulations. The regulations apply to all upholstered furniture manufactured after 1950 including all soft furnishings, foam filled items and loose and stretch covers. Most furniture purchased from a reputable supplier after 1 March 1990 should comply. Compliant furniture will bear the appropriate labels as illustrated. If the label has been removed, proof of purchase in the UK is required to prove compliance. The regulations state that all gas appliances, pipework and flues must be checked annually by a GAS SAFE registered engineer to ensure they are safe. At the commencement of any tenancy, a copy of a current Gas Safety Record must be provided to the tenants. Annual checks are required thereafter and a new Gas Safety Record must be provided to the tenants within 28 days of the expiry of the previous one. Records should be retained for a period of two years from the date of the check and made available for inspection upon request. Failure to comply with the Gas Safety Regulations could result in imprisonment and/or fine. These regulations apply to all electrical equipment with between 50 and 1,000 volts of alternating current or 75 and 1,500 volts of direct current. The regulations state that ‘persons who, in the course of business, let accommodation which equipment must be ‘safe’ and not cause ‘danger’. In order to meet these requirements the electrical supply and all electrical appliances must be tested by a competent person such as an NIC qualified electrician. A check annually, or when a new tenant takes possession of the property, is recommended. Instruction booklets or written instructions for all electrical equipment should be left in the property. A note of these together with the date of the safety check should be recorded in the inventory. If the electrical equipment does not comply with the regulations and an accident occurs, it could result in up to six months imprisonment and/or a fine of up to £5,000.